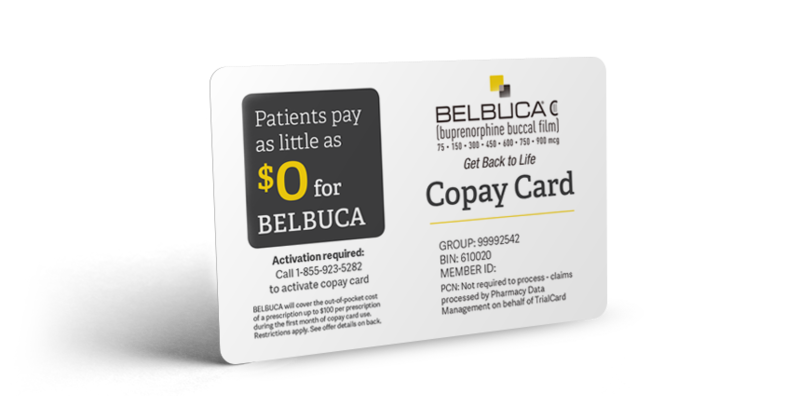 Enables eligible patients to save on their monthly prescriptions.† Since each BELBUCA® Copay Card contains a unique number, please do not photocopy or print multiple copies of your card. Provides a 24-hour support line where representatives get you started using the BELBUCA® Copay Card. Call 1-855-9BELBUCA, available 24 hours a day, 7 days a week. This offer is valid for the purchase of BELBUCA®manufactured for BioDelivery Sciences International, Inc. and lawfully purchased from an authorized retailer or distributor in the United States or its territories. This offer is not insurance and is not valid for mail order or prescriptions purchased under Medicaid, Medicare, TRICARE, or similar federal or state programs, or for patients who are Medicare eligible and enrolled in an employer-sponsored group waiver health plan or government-subsidized prescription drug benefit program for retirees. Offer not valid where prohibited by law, taxed, or restricted. Your offer has its own unique ID number. This offer is not transferable, is limited to one per person, and may not be combined with any other offer. Offer must be presented along with a valid prescription for BELBUCA® at the time of purchase. If you lose your card before the first time you use it, simply print or download a new copy at BELBUCA.com and bring it to the pharmacy. BioDelivery Sciences International, Inc. reserves the right to change or discontinue this offer at any time without notice. *BELBUCA® will cover the out-of-pocket cost of a prescription up to $100 per prescription during the first month of copay card use. Restrictions apply. See offer details on back of Copay Card. †In the 1st month, eligible patients pay as little as $0 up front and save up to $100 off their copay per prescription, for up to 3 prescriptions. In the 2nd month, patients pay as little as $25 up front and save up to $75 off their remaining copay per prescription, for up to 3 prescriptions. In the 3rd-12th months, patients pay as little as $25 up front and save up to $75 off their remaining copay per prescription, for only 1 prescription per month. Restrictions apply. Please see eligibility criteria on the back of the card.